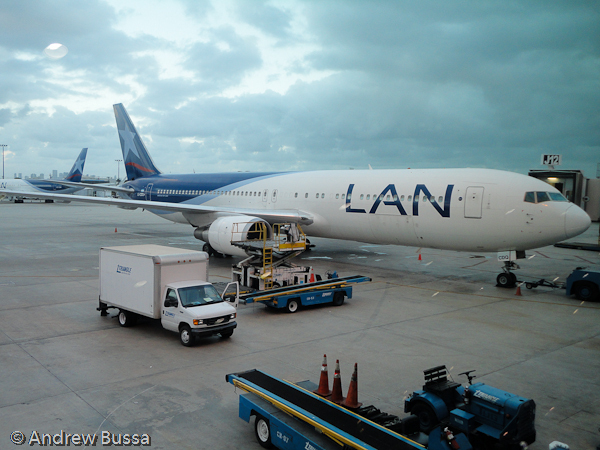 I arrived at MIA very early for my flight because I wanted to see everything LAN had to offer. Turns out I was a tad optimistic. There was a dedicated check in counter for Business passengers with no line, while there were over 60 people in line for the coach counter. Check in was fast and I was given my MIA-SCL boarding pass and a lounge invitation. MIA, if you are not connecting, is a nice airport. There were plenty of good views, I saw the Lufthansa A380 push back, decent food options, and great duty free shopping available. There wasn’t even a line at security. 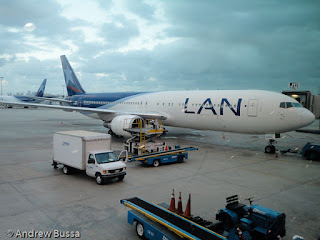 I stopped into most of the shops in south terminal and then went to the LAN contract lounge, Club America – J. 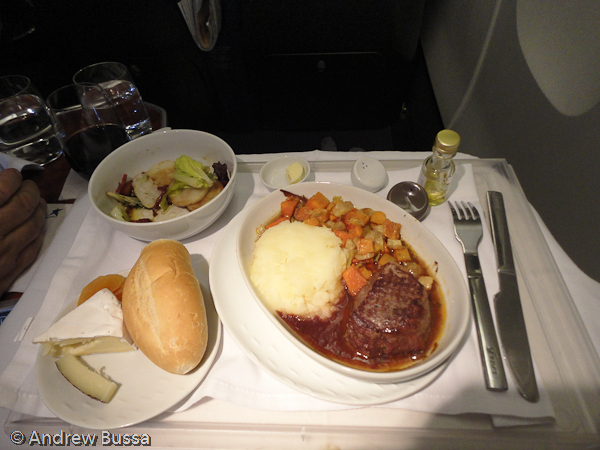 The lounge has a First Class side and a Business Class side, both had the same offerings. I was directed to the smaller First Class side. The lounge had free wifi, light snacks, soups, sodas, and off brand liquor. 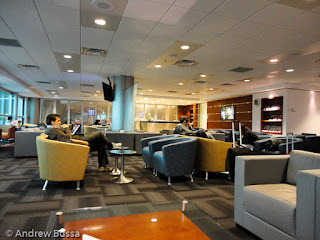 Like many lounges there is a shortage of outlets and they are not easy to access. There was a computer room with a few machines for shared use (though most users didn’t feel inclined to share). 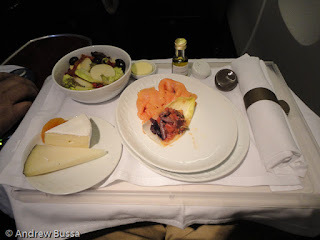 The food offerings were mostly chips and cookies with a few finger sandwiches that were never refilled; I was generally disappointed after enjoying the wide spread offered by Lufthansa earlier in the trip. Also, the lounge became very full, lots of poorly behaved kids, later in the night just before most of the LAN flights started go. 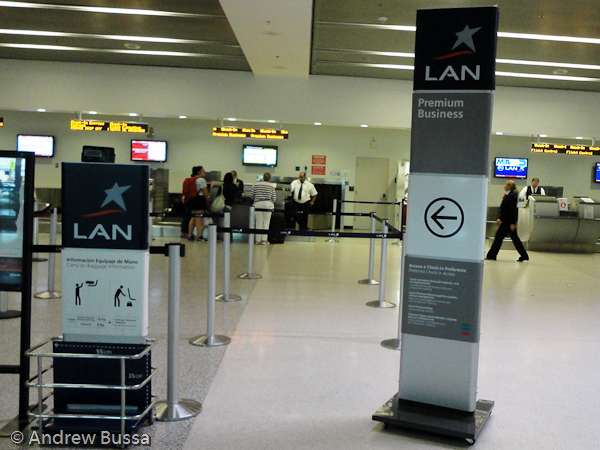 LAN doesn’t board on time or in a very organized manner anywhere in their network. Boarding started about 25 minutes late for no apparent reason. I was at the front of the mess and made it on board without too much pushing around. 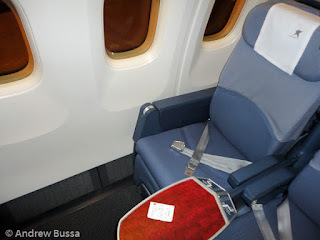 The Business cabin on the 767 had new lay flat seats with a 15in screen. The cabin was 5 rows of 2x2x2 seating and 100% full. I had a window seat and was quickly situated. When the airline has no first class, what type of food service in the highest class should you expect? I hope hoping for first class presentation, first class attention, and business class portions and courses. It wound up it was all business class, but with coach class service. 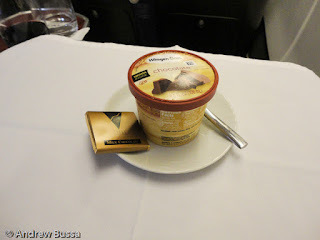 The drink service started about 40 minutes after takeoff, a long wait for such a late departure. Airlines should be quick to start service to maximize sleeping time on overnight flights like this. I started with a salmon appetizer accompanied with salad and cheeses. That was followed by a small fillet with mashed potatoes and mixed veggies. I opted for ice cream for dessert. The meal was good and the wines offered were excellent South American offerings, but this was offset by slow and not attentive service (there was a long stretch when my wine and water glasses were empty). After dinner I settled into my seat to watch a movie before bed. The was a large selection and wide variety of films to pick (I watched 500 Days of Summer and it was a real bummer). After the movie, I put my seat down to the flat position and went almost right to sleep. The seats are described as parallel to the floor flat seats, not angled flat. It’s true, but it felt like each seat section was a little bit lower than the last, like a stepped configuration. This made it feel more slanted than I liked, but I drank a lot of red wine and it was late, so I was out like a light in any setting. Breakfast was offered before arrival. 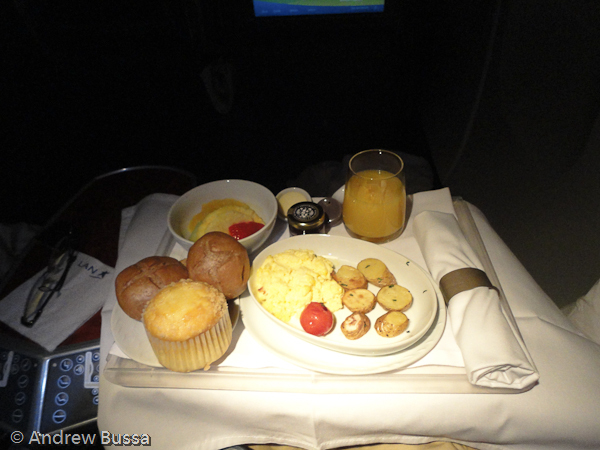 I opted for the full breakfast served 45 minutes before arrival over the quick bite meal served just before landing. The meal consisted of scrambled eggs, potatoes and some fruit. It was very bland. The plane landed on time and there was a quick taxi to the gate. Once the seatbelt sign came off two flight attendants rushed down the aisle and closed the curtains separating coach. I’ve never seen this before, but it’s a cool way to keep business class passengers from feeling rushed. SCL charges a $140 fee to Americans to come into Chile (not charged for international transit passengers), but I used Irish passport and avoided the charge. 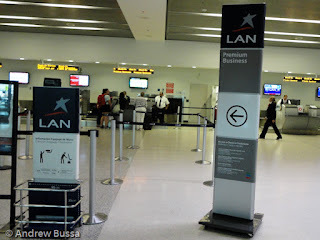 LAN does not give out customs fast track passes, so the immigration line took about 40 minutes to clear. After customs, I went through a duty free shop, down to baggage claim, through agricultural inspection (all your bags will go through a screener), and finally into Chile. Plan on it taking an hour without checked bags and 90 minutes with.